About a year ago, our Digital Marketing team was sitting at lunch talking about whether one of our clients, who offered a medical service geared toward women, would be a good fit to advertise on Pinterest. Everyone was apprehensive, except me. Hello, my name is Megan and I am a Pinterest addict. I spend several hours/week on Pinterest planning meals, collecting craft ideas and gathering information about my interests and obsessions. My infatuation with this platform gave me an advantage in the conversation. Of course I could sell this service on Pinterest! I knew everything there was to know about what topics are popular on the platform and who, generally, was searching for it. I was so confident that, within a few months, we were doing keyword research and building Pinterest campaigns. We even had our own Pinterest rep! Over the last year, we’ve had a lot of success advertising specific products and services on the platform and I’m excited to share my targeting tips with you. 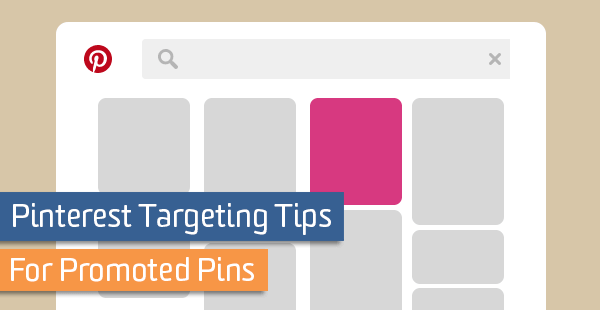 Pinterest gives advertisers a few different ways to target their audience and knowing how to choose the right options and combine targeting tactics will help improve the results of your campaign! Interest is one of the broadest targeting options available on the platform. As you can see in the image above, you can target something as broad as “animals”, but you can also drill down to a more specific category like “pet accessories”. If you plan to use Interests, always choose a more detailed option (like pet accessories) rather than the overarching theme. This will help you reach a more specific group of people. You should also pair it with another one of the options below. In my experience, using just Interest is too broad of a targeting method and you end up spending more money on people who aren’t as enthusiastic about what you’re selling. Much like advertising on other platforms like Facebook or AdWords, keywords are a big part of getting Promoted Pins in front of the right people. Using this targeting method is nothing new, but how you find the right keywords can make a big difference. Pinterest recommends you use their Keywords section (which you can find in the ad set up) to choose keywords. You can see an example of this in the image above. However, I’ve found it far more useful to use the search bar. Notice that in the keyword tool, when I search “sandals” I’m getting all general recommendations. However, in the search bar, I’m seeing much more detailed results below it like “boho”, “strappy”, and “wedge”. This is how people actually look for sandals when their shopping online. Not by searching “sandals summer”. They’re not ready to buy yet if they’re using that term. They’re browsing. Maybe not even with the intention to purchase. Another thing that I’ve noticed about the keyword tool is that it often tries to target a gender. If I’m typing in “shoes” it will append “for women”. Pinterest learns what you like as you use the platform, so if you’re the one searching for “shoes” it probably knows whether you’re male or female already and will give you the most ideal results based on your search history. Keep in mind that there’s also an option to target a specific gender when you’re setting up a new ad. So, targeting “shoes for women” isn’t going to be as helpful. I also use the search results as a keyword research tool. When you want to target a topic, type it in and hit enter, then dig through the results. Sometimes there are some goodies hidden in there. Look at the image above. Just in this small section, I’ve found 6 more keywords. Try these methods of keyword research next time you’re working on a new campaign. Better known as remarketing or retargeting on other advertising platforms, audience targeting lets you show your ads to the groups of people listed above. These audiences are filled with people who have been to your site. In order to get this information, you’ll need to add the Pinterest tag to your website, but once that’s done you can start filtering visitors down by URL or website Event. For example, rather than targeting any user that’s been to your site in a given period of time, you can choose visitors that have been to specific pages, because that is a more interested audience. To do this, you can choose that URL for your audience and anyone who has been your pricing page and is active on Pinterest will see your ad. 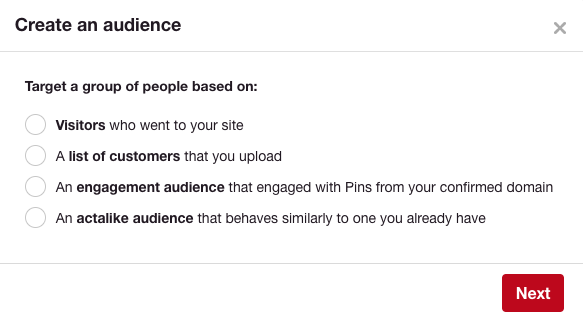 Advertisers must build these audiences in Pinterest. You can’t import an audience from Google Analytics or any other platform. So be prepared for the waiting period needed for your audience to grow to 100 people. You can import a list of customers. So if you have a nicely sized email list, that’s a great way to reach people you already know are interested in your product/service. Be aware that in order for these people to see your ads, the emails in your list need be the same emails that are used to log on to Pinterest. If you have a collection of business email addresses, this may not help too much. Just like the look-a-like and similar audiences in other advertising platforms, these are a group of people with a similar behavior on Pinterest as an audience you’ve already built. That means similar searches, views, repins and saves. Again, these audiences need to contain at least 100 people to serve your ad. While the previous two options are great for re-engaging with previous visitors or customers, this option is the one you’ll want to focus on for growing your reach and finding new customers. Use Visitor audiences to build a funnel: If you know there a few specific pages on your site that people look at before they buy something, set each page up as a Visitor audience URL and advertise to that audience again to push them further through the funnel. Promote your email list: We ran an A/B test last year to determine how effective popups were in getting people to subscribe to our blog. We discovered that it was 240% more effective than our other two methods. So, push your email list to ensure growth. The bigger the email list, the better your chances of targeting email addresses of Pinterest users. Location is important if you are not a widespread company. This is super important for the small businesses out there. If you only sell products in Phoenix, AZ, you don’t want to be advertising in Pittsburgh, PA because we can’t buy from you. Make sure you specify your location so you don’t waste money. You can choose more than one location. I know many of you are rolling your eyes right now, because it seems so obvious, but we need to talk about language. I’m sure you’ve clicked on many links that lead to a website in a language that you don’t speak. And I’m sure you leave immediately, so that company just paid for a click that resulted in nothing. It’s important that you target people who speak the language your website is written in. 80% of Pinterest traffic comes from a mobile device, which means that you shouldn’t only target desktop users. Unless, of course, your website isn’t mobile-friendly (in which case I would argue that you shouldn’t be advertising at all). An example of when you might want to target a mobile device only would be for an online promotion. A few years ago, Domino’s did a promo on Twitter: users could tweet them a pizza emoji to place an order. This would been a GREAT campaign to target mobile devices. If you’re already on your phone, it’s pretty easy to switch apps and text a pizza emoji. In the case of the medical service we were advertising, gender was important because it was directed toward women. So, we targeted women on Pinterest (we also tested a campaign targeting men but, as you might imagine, it wasn’t as effective). If your promotion, product or service isn’t specific to women or men, don’t exclude either. By the way, don’t think targeting men on Pinterest is a lost cause. Males now make up 40% of new sign ups. That’s an increase of 70% for male users compared to last year. We’ve had great success using Pinterest for the right clients, so I encourage you to look into this advertising platform if you haven’t already. Take a good look at your Google Analytics data to determine who is looking at your site and buying. That will help you determine who to target on Pinterest. Always remember to test different imagery, targeting, etc. to see what works best.